Pearls are natural beauties and they symbolize the perfect blend of sophistication, excellence, harmony and complete purity. What is even more beautiful is the pricing for these fashionable rings which falls far under the price of diamonds but that doesn’t mean that they do not have monetary and sentimental value. Before you purchase a lovely pearl engagement ring there are a few things that you should take into consideration. For one, there are two kinds of basic natural pearl qualities: freshwater and saltwater. Freshwater pearls are pearls that come from mussels that are located in rivers and lakes. Saltwater pearls are usually round pearls that are the more expensive of the two. Akoya Japanese pearls and Tahitian pearls are the most expensive saltwater pearls available. Also, when you are looking at pearls don’t be afraid to ask questions and look for businesses that offer you certification which is the best way to ensure what you are getting is top-notch quality. 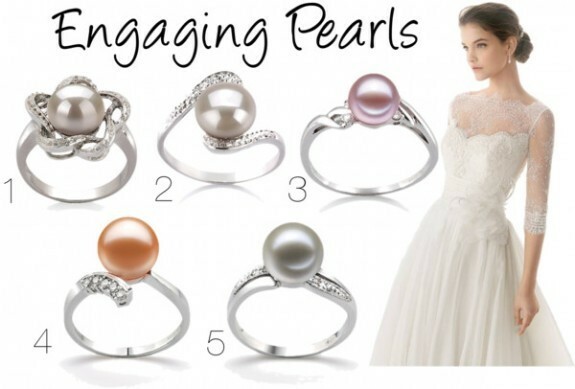 Another awesome benefit of pearl engagement rings is that they come in beautiful colors other than “pearly white”. You have choice colors like lavender, black, and pink. There are also ways to get the colors mixed—amazing! Let’s not forget all of the amazing settings and framing that are available or you can also have one customized. Choose from framing that is in silver, and yellow or white gold. And if your lady must have a few diamonds, you can have them added as décor. You should always do your research when purchasing any form of jewelry to be certain that you are getting the quality of product that you paid for. Research the company before you purchase any jewelry. The Better Business Bureau is always your best bet or look for reviews online; knowing a person’s experience with a company surely helps. Ask if your pearls come with certification and don’t be afraid to have it appraised by another jeweler to be definite that the framing, pearl quality, diamonds, and details are genuine and authentic. Lastly, learn more about pearls. Here at “Pearls Only” you can gain a wealth of information. The guide is filled with everything you need to know about pearls, pearls and more pearls! We hope that your engagement and wedding are a huge success and feel free to share your experience with us! This entry was posted in PearlsOnly Blog and tagged engagement ring, engagement rings, fashion, pearl, style, wedding by PearlsOnly Team. Bookmark the permalink.